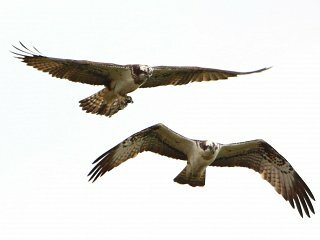 This year our two resident Ospreys returned safely to Lochter in the second week of April. This was slightly later that usual, but who can blame them staying in warmer parts for a few extra weeks. The pair began refurbishing the nest, and the female (Libby) began sitting in late April. The Male (Branson) has been attentive in doing most of the fishing and taken turns of around 1.5 hours sitting on the eggs. The nest was deeply dished as usual giving only glimpses of the eggs, of which we could see two. On Tuesday of this week (26th of May) we had two eggs hatch to reveal very hungry chicks. Both seem to be thriving and are being fed around 6 times a day on Lochter's home grown rainbow trout. Sometimes in the heat of the day, Branson will disappear down the Lochter burn to do a spot of river fishing, often returning with a brown trout. The Lochter ospreys are available to watch throughout the day from the live nest cam in the restaurant.